Called the morning of our check in spoke with Daniel, was very friendly and helpful. Make reservations for the same unit in May, spoke with Gale in reservations, also very friendly, pleasant and helpful. We enjoy Rumbling Bald because of all the amenities, once you arrive, really no need to leave the resort, Legends food is good, everyone very friendly and helpful. We cant wait to spend another weekend there! Our whole family got together and we all enjoyed ourselves. From relaxing in the Jacuzzi to hiking to playing games and cooking... Very little need for social media or TV. The entire team was always attentive to our needs. Any question or issue was answered or handled fast and professionally. When I had questions before arrival, the emails were always answered quickly. I would come back just based on the fine staff at Rumbling Bald Resort. Throughly enjoyed the tour of the lake and learning the history of how the lake came to be where it is today. Our boat Captain, who relocated from Florida, had so much interesting information on the history, as well as other facts about the homes and surrounding area! We love this resort! From the moment we began visiting while looking for wedding venues, we were overwhelmed by the beauty of this resort. The lake & surrounding mountains provide a gorgeous view & the resorts amenities cannot be matched anywhere around here. We found that we did not even have to leave the resort unless we needed groceries. The restaurants on the resort are incredible & not overpriced. It is not only couple-Friendly but also kid-Friendly. When a flood washed out part of our ceremony site, the staff worked hard to clean up the area as best as possible to still give us a beautiful wedding. We will return to this resort in the future! Hands down the best stay we have had is at Southern Comfort. We stayed here for our wedding & were thrilled that this cabin was pet-friendly. However, it was so clean that you could barely tell that pets had been there! The upper level is open & spacious with a wrap around deck & beautiful view of the mountains. The bottom level has 3 beds & 2 baths that were spacious. There was also a large game room behind the bedrooms with a tv, games & ping pong table. Beautifully decorated & clean with updated amenities. This cabin is in a great location & unlike some of the other cabins, isnt too far up the mountain. It is about 5 minutes from the main resort activities for which guest passes are provided. The owners have put a lot of love & care into this cabin & have thought of everything! When we return in the spring, we will look into renting this cabin again! Very friendly, laid back people. Nice, relaxed atmosphere. This is our 4th time staying at either RB or AV, and we have enjoyed every visit. We'll be back again I'm sure! Debbie Early was our Rep. for many years,until her retirement in 2017.She always did a great job getting our rooms, and early check in. She was great.Now Debbie Hester who is no kin to me, it was like we knew each other all of our lives. What a wonderful lady.Looking forward to getting out reservations through her. Gail was Who I spoke with at the front desk she was so professional and kind and able to accommodate my family with everything we needed. 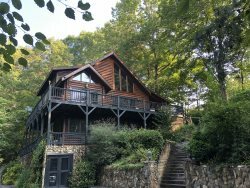 It is amazing clean property we enjoy the views the professional staff and the lake I recommend this for any family or just couples getaway thank you! Relaxing. Convenient. Comfortable site. Private. Beautiful location. We loved the Motorcoach Park, absolutely beautiful and very convenient to all the resort amenities. A hidden gem, we will be back soon! The staff was very friendly and helping, especially at the wedding. Our boat captain, Randy, was a stand-out! Everyone we met and interacted with, Restaurants, golf shop, etc.. was a pleasure. Even the Guard was pleasant! In my opinion, the staff at The Villas of Grand Cypress in Orlando are #1 in terms of providing a superior guest experience, but I think the Team at Rumbling Bald Mountain tied them! We liked the smallness of the Apple Valley RV Resort. Access to all the amenities required a vehicle; perhaps rental golf carts could be made available? Fortunately we brought our own car or our stay here would have been quite different. Last, our opinion is that signage at the entrance to AV Motorcoach Resort is way too small. We missed the turn-in upon arrival (see low score on ease of check-in). Pulled into next street past Victory Restaurant, unhooked our tow vehicle, enlisted the help of two workmen to block traffic, got turned around. Then, no one at the check-in to advise us, ask questions of. We found envelope with our package (when we made reservations and all subsequent communication no one mentioned the self-serve check-in process). Figured out the traffic flow best way to access site 102. Were ready for this process the next time, but for 1st timers it was stressful. Wonderful place for multi-family reunions. There is something for everyone. Gale Wilson was so helpful on finding a place for us!! Wish we could have stayed longer but the stay at Abby's Getaway was so enjoyable. Games to play there, ping pong table for the boys, big deck to be on and a grill to cook out! Fun time by all on both lakes!! Oh ice cream was yummy at the Cabana! Everyone was most helpful and eager to provide good service. We had trouble with one of the toilets & sink in the downstairs bathroom. It was looked at and taken care of in a very timely manner. Your staff is wonderful.... friendly, knowledgeable, respectful. The resort's grounds are beautiful and very well kept with many amenities to keep everyone busy.